It’s no surprise that Instagram is following in the footsteps of parent company Facebook by spinning off features into standalone apps. But it’s strange that the popular photo-sharing network chose something as basic as a time-lapse effect to become its own platform with Tuesday’s release of the new iOS app Hyperlapse. Available on iTunes, Hyperlapse lets you shoot a video within the app, apply a time-lapse effect from 1x to 12x regular speed, then share the video to Facebook or Instagram. Hyperlapse also saves the finished product to your Camera Roll, but doesn’t let you import a video. I strolled over to New York’s Grand Central Terminal to test the app by capturing the mid-day rush of lunching workers and tourists. When you open Hyperlapse, your only option is to start recording. You don’t have to press and hold the button as you would with other video apps—just let it roll until you’ve had enough. Because the time-lapse effect will significantly shorten your video, make sure you capture at least 30 seconds of footage. When you stop recording, you can use a slider tool to select how much lapse you want. A 1x effect is great for tracking shots, which should be smooth and stable like you’re rolling a camera on wheels. I prefer 6x or 8x, which makes a video of people strolling around look like a busy city scene. The effect is positively cinematic, especially once you share the video to Instagram and apply a filter. You can also opt to share the video to Facebook, or just save it for posterity, but these videos are designed to be filtered and shared. 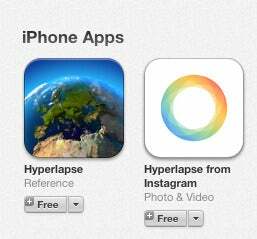 Which is why it’s so bizarre that Hyperlapse is a stand-alone app. It fits so well with Instagram’s other functions—recording video, adding filters, sharing—that instead of highlighting the feature, it seems like a form of exile. Instagram cofounder and chief technology officer Mike Krieger told Wired that the company “didn’t want to create a special use that would just be hidden.” But given that people already have so many apps—and that searching for Hyperlapse in the App Store turns up a very different app with the same name—Hyperlapse would make more sense as a feature within Instagram proper. You don't want to apply this effect to every video. Instagram isn’t quite like Facebook, where the main feed has spiraled out of control and any additional features just bog down and confuse the core experience. It makes sense for Facebook to have a separate chat app (Messenger) and a stand-alone photo-sharing app (Instagram). Those apps spinning off their own apps, like Instagram has done with ephemeral messaging app Bolt and now Hyperlapse, is just overkill. But aside from being unnecessarily unbundled from the Instagram experience, Hyperlapse is a solid app. It stabilizes your videos using your iPhone’s gyroscope and gives them a cinematic quality that other apps don’t—and can’t. An Android version of Hyperlapse is reportedly in the works. This story, "Hands-on with Hyperlapse, Instagram’s super simple time-lapse app" was originally published by TechHive.